Most bakers are usually reluctant to bake in the summer time, because no one wants to have yet another source of heat bearing down on them. Out comes the no-bake recipes: no-bake cheesecakes, puddings, trifles. 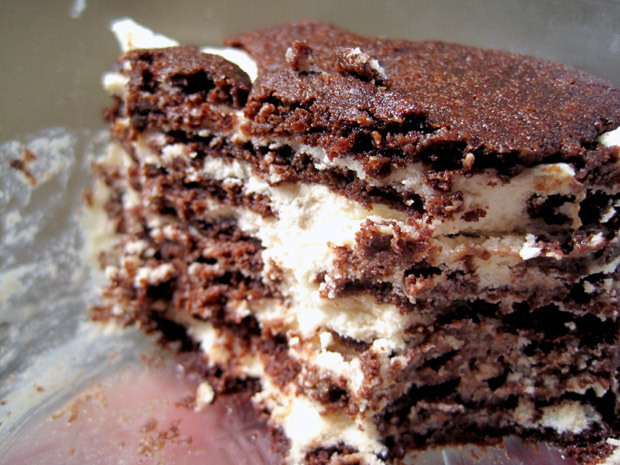 Icebox cake (or zebra cake) is one variation of the ever-classic trifle. I strongly believe that contrasting textures makes a dish especially compelling, and the basis of most trifles: a creamy spread and a cakey layer offers that palate-teasing complexity. I opted to make my own chocolate wafers, but I’m sure you can purchase them if you preferred to save some time. However, these wafers are top-notch, and if you’re one of those people that prefer the cookie bit of an Oreo to the cream (it’s an atrocity but I used to discard the cream bit), these cookies would really hit the spot. I also added a couple of tablespoons of Bailey’s in the whipped topping – because why not, right? It added a subtle alcoholic touch to the dessert with an accented chocolate taste Because of how light this dessert tastes in your mouth, it’s very easy to eat quite a lot of it. Restraint, my friends, restraint. Whip the cream till stiff peaks form. Add in sugar and Bailey’s, if using. 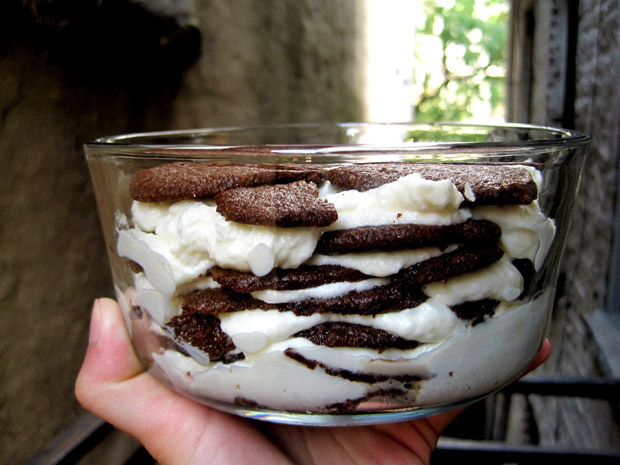 Alternate layers of chocolate wafers and whipped topping in a bowl, with the wafers forming the bottommost layer. Leave to set at least overnight or up to a day, until wafers soften and become cake-like. Combine the flour, cocoa, sugar, salt, and baking soda in the bowl of food processor and pulse several times to mix thoroughly. Cut the butter into about 1/2 inch chunks and add them to the bowl. Pulse several times. Combine the milk and vanilla in a small cup. With the processor running, add the milk mixture and continue to process until the mixture clumps around the blade or the sides of the bowl. Transfer the dough to a large bowl or a cutting board and knead a few times to make sure it is evenly blended. Form the dough into a log about 7 inches long and 1 3/4 inches in diameter. Wrap the log in wax paper or foil and refrigerate until firm, at least one hour, or until needed. Preheat the oven to 350°F. Line the baking sheets with parchment paper. Cut the log of dough into slices a scant 1/4-inch thick (I went thinner, closer to 1/8 of inch. If you’re trying to emulate the store-bought wafers, slice as thin as you can, and watch the baking time carefully, as it might be less.) and place them one inch apart on the lined sheets (cookies will spread). Bake for a total of 12 to 15 minutes. The cookies will puff up and deflate; they are done about 1 1/2 minutes after they deflate. Cool the cookies on the baking sheets on racks, or slide the parchment onto racks to cool completely. These cookies may be stored in an airtight container for up to two weeks or be frozen for up to two months. Note: These cookies should crisp as they cool. If they don’t, you’re not baking them long enough, in which case, return them to the oven to reheat and bake a little longer, then cool again. I know my frosting skills are pretty much non-existent, but I believe the inclusion of Frangelico and Bailey’s in this cake absolves my sins. I was much too impatient to let the cake cool fully and I should have let the frosting set in the fridge too, but alas. It is at least a good cake. The cake itself is pretty stellar, very moist and tender-crumbed. I had some half-and-half around, and I searched around for a good recipe that includes it, but after several scone and pie recipes (scones are no fun without fresh berries, and pies are just not my area of expertise), I finally found a winner: a chocolate cake recipe. I really like how it’s a one-bowl recipe that doesn’t require the use of a mixer. I’m all about minimizing the amount of dishes I have to wash, and if can prepare a cake using just a bowl and a spatula, that is the recipe for me. Oh, owning a digital scale really helps in reducing the dirty dishes too. I’m so glad I bought it. I tweaked the recipe some. I don’t have coffee, so I substituted the coffee with Frangelico and water instead. 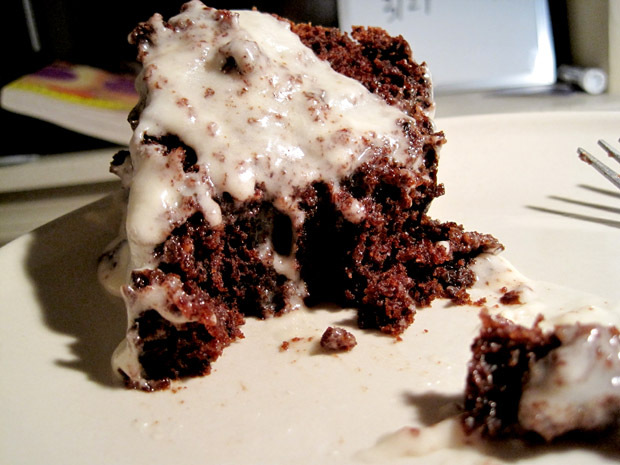 The cake is probably a tad sweeter than it should be because of that, so maybe you should reduce the sugar by a couple of tablespoons if you intend on adding Frangelico, or better yet, Kahlua. 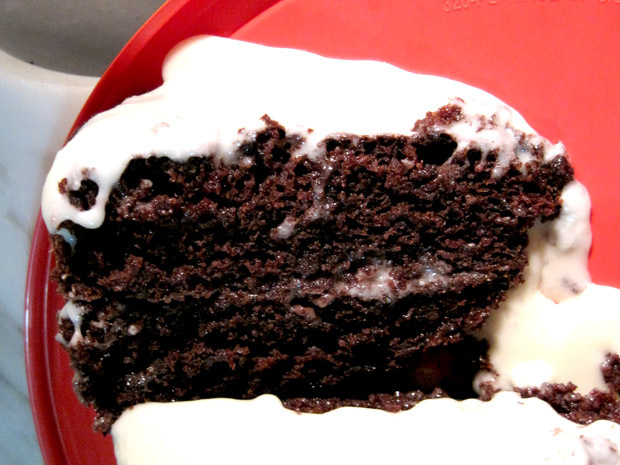 The frosting recipe was originally just a chocolate buttercream, but I just eliminated the cocoa powder and replaced it with a couple tablespoons of Bailey’s. The Bailey’s that I happen to have around is the one with a hint of hazelnut, and I thought it’d complement the Frangelico in the cake. Anyway, chocolate and hazelnut, boozed up: it really doesn’t get better. Preheat oven to 350 degrees F. Spray two 9 inch round baking pans with flour-added cooking spray or grease and flour using your favorite method. In a large mixing bowl, stir together the sugar, flour, baking soda & baking powder, salt and cocoa powder. Stir them well so that they are very thoroughly combined. Stir in the rest of the ingredients. Batter will be wet and soupy looking. Mine had little flecks in it, but they baked away. Bake for 35 minutes or until cakes test done. Let cool on rack for 10 minutes, then flip from pan and cool completely before frosting. Combine all ingredients except the sugar in a large bowl and beat until very smooth. Gradually beat in the sugar until the frosting is smooth, thick and fluffy. Spread on cooled cake.